In its Weekly Report On Israeli Human Rights Violations in the Occupied Palestinian Territories for the week of 29 September- 05 October 2016, the Palestinian Center for Human Rights (PCHR) found that Israeli forces continued to use excessive force in the Occupied Palestinian Territories. A Palestinian civilian was killed at Qalandia checkpoint, north of occupied Jerusalem. 7 civilians, including 4 children, were wounded in the Gaza Strip. In the West Bank, Israeli forces killed, on 30 September 2016, Nasib Abu Maizer (28), from Kufor Aqeb village, north of occupied Jerusalem. The aforementioned person was killed when Israeli forces stationed at Qalandia military checkpoint, north of the city, opened fire at him, due to which he sustained 5 bullet wounds throughout his body. He was left bleeding for over an hour as the Israeli forces denied medical crews from the Palestine Red Crescent Society (PRCS) access to the scene until he died. Israel forces then kept his corpse. They claimed that Abu Maizer had stabbed a soldier and caused him moderate wounds. Israeli forces conducted 48 incursions into Palestinian communities in the West Bank and 6 in Jerusalem and its suburbs. 46 civilians, including 7 children and a woman, were abducted. 29 of them, including 3 children and the woman, were abducted in occupied Jerusalem. Israeli forces continued their efforts to create Jewish majority in occupied East Jerusalem. The Israeli municipality obliged a Palestinian civilian to self-demolish structures attached to his house in al-Sa’diya neighbourhood in the Old City. Israeli forces turned the West Bank into cantons. Dozens of temporary checkpoints were established in the West Bank and others were re-established to obstruct the movement of Palestinian civilians. 3 Palestinian civilians, including a child, were abducted at military checkpoints. In the Gaza Strip, on 30 September 2016, 5 Palestinian civilians, including 4 children, were wounded when Israeli forces stationed at the border fence between Israel and the Gaza Strip, east of al-Shuja’iya neighbourhood, east of Gaza City, opened fire at dozens of Palestinian youngsters who headed to Nahal Oz area, east of al-Shuja’iya neighbourhood to participate in activities supporting Jerusalem. On 30 September also, 2 Palestinian civilians were wounded when Israeli forces stationed at the border fence, east of al-Bureij refugee camp, opened fire at dozens of youngsters who headed to that area supporting Jerusalem. The first was wounded by a bullet that entered and exited the left thigh while the other was hit by a gas canister to the chest. They were both taken to al-Aqsa hospital in Deir al-Balah, where their wounds were classified as moderate. On the level of land attacks, on 05 October 2016, Israeli forces stationed at the border fence between the Gaza Strip and Israel fired an artillery shell at a checkpoint for al-Qassam Brigades (the armed wing of Hamas movement), north of the Gaza Strip. As a result, the checkpoint sustained serious damage but no casualties were reported. Concerning air raids, on 05 October 2016, Israeli warplanes carried out a number of air strikes on open area and training sites of Palestinian armed groups in the Gaza Strip. The attacks resulted in material damage but no casualties were reported. Israeli forces continued settlement activities in the West Bank. 30 olive trees in Silwad village, northeast of Ramallah, were burnt. A settler attacked a Palestinian vehicle in Qalqilya. On 01 October 2016, fire broke out in Sharif valley, west of Silwad village, northeast of Ramallah. Over 30 trees belonging to Mohammed Baker Hamed caught fire. 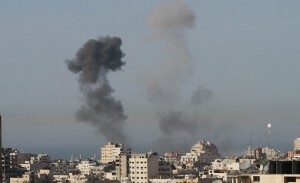 Eyewitnesses said that they saw Israeli forces patrolling the aforementioned are had fired sound bombs in the place. As a result, the weeds caught fire that burnt the olive trees as well. On 02 September 2016, Israeli forces handed Mohammed al-Azazma, from Khellet al-Hajar area, east of Yatta, south of Hebron, a notice to halt construction works in his house under the pretext of non-licensing. Concerning settler attacks against Palestinian civilians and property, on 02 October 2016, a settler from “Karnei Shomron” settlement attacked a vehicle belonging to Samih Nazzal, Police Chief of Qalqilya. It should be noted that Nazzal had parked his vehicle and went to his family that was reaping the olives. As a result of the attack, the windshield and tires were damaged. Nazzal estimated the damage at around NIS 1,000. Following the Friday prayer, 30 September 2016, Palestinian civilians and Israeli and international human rights defenders organized protests in Bil’in and Ni’lin villages, west of Ramallah; al-Nabi Saleh village, northwest of the city and Kufor Qaddoum village, northeast of Qalqiliya. Israeli forces forcibly dispersed the protests, firing live and rubber-coated metal bullets, tear gas canisters and sound bombs. They also chased protesters into olive fields and houses. As a result, some of the protesters suffered tear gas inhalation while others sustained bruises as Israeli soldiers beat them up. The coordinator of Nilin Nonviolent Resistance Committee, Mohamed Amirah said to PCHR’s fieldworker that Israeli forces abducted an Israeli activist, but released him two hours later. At approximately 14:00 on Friday, 30 September 2016, Israeli forces stationed at the border fence between the Gaza Strip and Israel, east of al-Shuja’iya, east of Gaza City, fired live bullets and rubber-coated metal bullets at Palestinian young men, while they were on their way to Nahal ‘Oz area, east of al-Shuja’iya participating in activities held in solidarity with Jerusalem. The activities continued until 18:00. As a result, 5 civilians, including 4 children, were hit with live bullets. Among the wounded persons was Mohamed Osama Ziyad Helis (17), who was hit with a live bullet to the knee, and was then taken along with 2 others wounded to al-Shifa Hospital, where medical sources classified his wounds as serious and he is so far in the hospital. The wounds of the 2 other civilians were classified as moderate. Helis stated that he and a group of civilians headed to Nahal ‘Oz site, raising 2 flags and using secateurs to cut the barbed wires. They also threw stones at Israeli soldiers, who opened fire at them. (PCHR keeps the names of the wounded persons). Around the same time, dozens of Palestinian young men headed to the border fence between the Gaza Strip and Israel, south of al-Burij refugee camp, to Support Jerusalem. They threw stones at the Israeli soldiers, who fired live bullets and tear-gas canisters at them. As a result, Jihad ‘Atyia al-Qernawi (22) was hit with a live bullet to the left thigh (entered and exited), while Omar Khalid al-‘Aryian was hit with a tear gas canister to the chest. Both of them were taken to al-Aqsa Hospital, where their wounds were classified as moderate. Due to the number and severity of Israeli human rights violations this week, the PCHR made several recommendations to the international community. Among these were a recommendation that the international community act in order to stop all Israeli settlement expansion activities in the Occupied Palestinian Territories through imposing sanctions on Israeli settlements and criminalizing trading with them.